A new wheel company has launched this week by Alex Irvine and Richard ‘French’ Sayer with a team of total rippers on board for the ride. Car 13 has the likes of Sebi Dorfer, Sam Beckett, Steve Forstner, Julien Benoliel, Jake Collins & Rikk Fields on the team roster. Expect more from this crew in 2016. 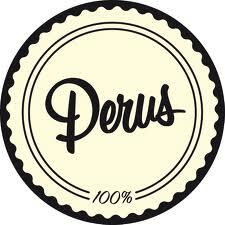 The Perus crew have welcomed Alex Siegfried to their team this week. Click play for fast feet and flip late shuv goodness right here. Those lazer-eyed cats that run Skate Mental have rolled out their Spring 2013 catalogue this weekend. 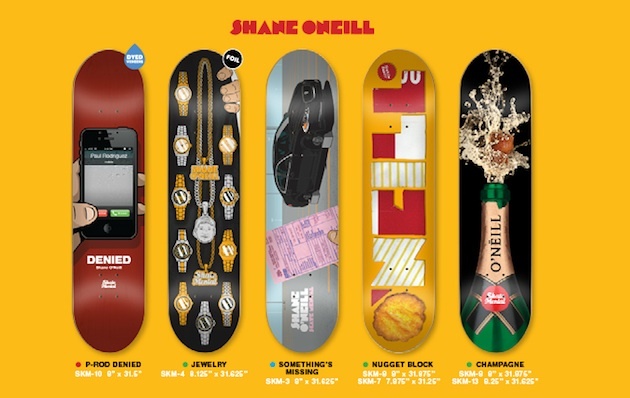 Shane O’Neill, Dan Plunkett, John Motta, Brad Staba and Matt Beach all have new pro decks. 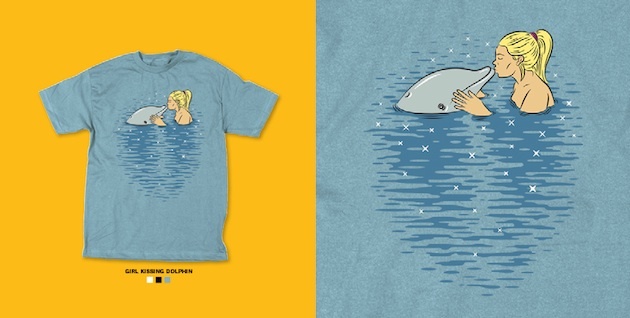 A selection of one-off decks are also available alongside a new Evil Cat tee, tees featuring a Girl snogging a Dolphin, Wet T-shirts, stoned dinosaurs, Rainbow Uzi’s, beanies, caps, long socks, Fake Crap wax, Three in the Pink, One in the Stink Wheels and loads more. 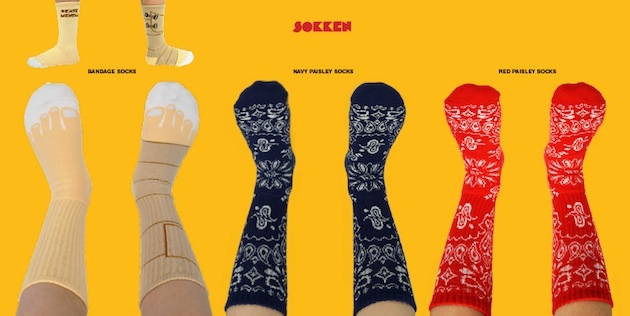 There’s some of the new range featured here but find the full set on their site. Those who witnessed the Xmas Jam live back in December will no doubt be reminded that Supertoxic Urethane‘s Lloyd McLeggon‘s skateboarding pops like a Smith & Wesson and ends in bolts. Press play on this best of 2012 clip that has been put together of some of the highlights from Lloyd’s year and look out for much more from him in 2013. 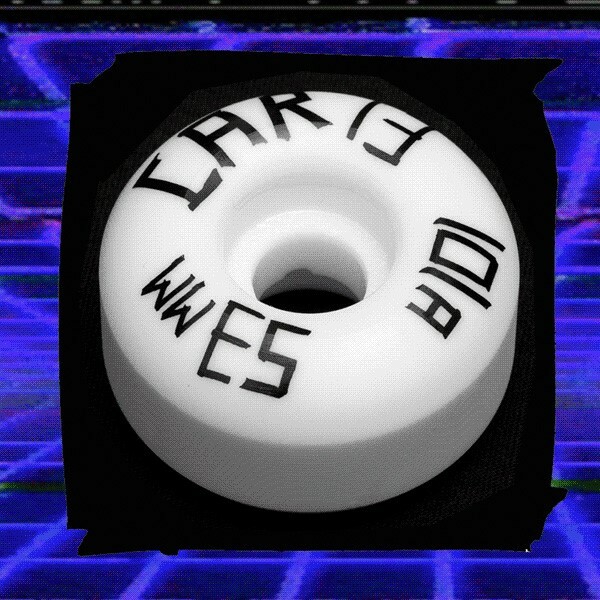 In related Supertoxic news, the new Wasteman Wheel (below) is out now in various sizes. Get on it. Watch Manuel “Mogely” Herrera’s Landshark welcome! Manuel “Mogely” Herrera has an explosive welcome edit to Landshark Wheels online this week. More firecracker action too. This is a ridiculous edit. Let it be known that here at Crossfire we think that the Unabomber ‘Wings’ logo is one of the all-time best logos created by a skate brand. Sure, it gets credit in that it’s instantly recognisable and brings back fond memories of rummaging through wardrobes and drawers in search of your favourite hoody (find me a British skateboarding who never owned at least one Unabomber hoody and I’ll tell them the exact point where their life went wrong), but when do you hear it mentioned alongside the likes of Jim Phillip’s ‘Screaming Hand’ or the Thrasher logo? It arguably has an equal cultural significance, at least on this side of the pond and we reckon that it should be the result of more drunken tattoos. Regardless, when this package arrived with these 54mm wheels bearing the gentlemanly wings we were super stoked to have a long overdue re-watch of ‘Up The Rebels!‘ and go shredding on the brand’s new urethane. I frequently choose Unabomber Wheels due to their affordability and reliability and with their new urethane formula (wryly named ‘neurethane’) they remain very high up in my list of favourite wheels. The Daft Punk-esque tagline ‘Harder. Faster. Longer.’ is as legit as the tune itself and after a mighty powerslide session or seven these still feel fresh out the pack, withstanding the notorious violence of waxed-up floors of multi-storey carparks and wearing only a tiny bit of subsequent bruising. Unabomber also have some new bolts out in regular raw silver and black and blue and white. It goes without saying, they do the job and they do it well. 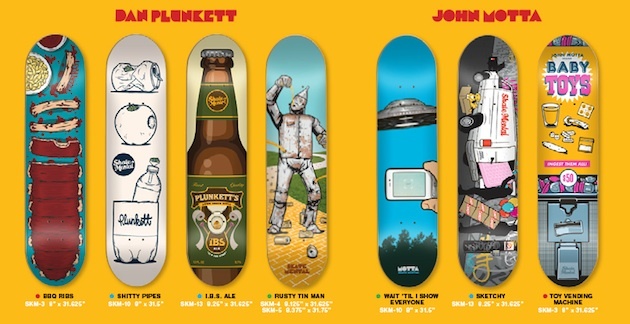 Check ’em out, throw some stickers on your board and go fly. 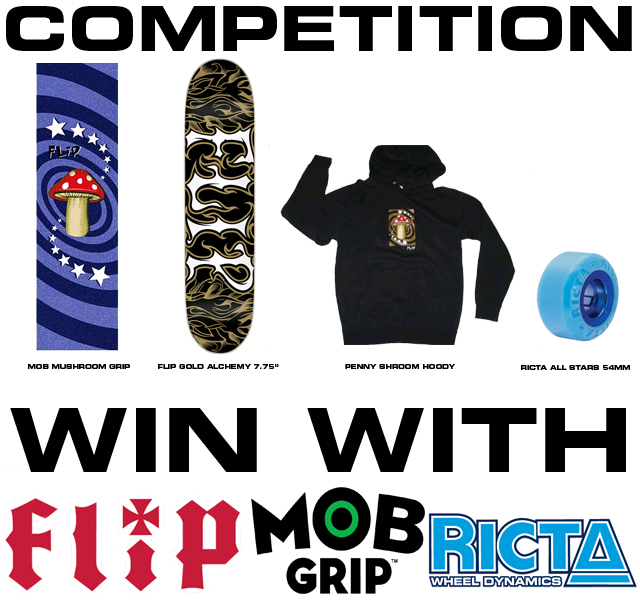 Fresh from sponsoring our Xmas Jam Mini Ramp comp and shelling out hard cash for those that earned it (Greg Nowick, Jed Cullen, Craig Coombs), Flip, Mob Grip and Ricta Wheels stored some goodies aside that weren’t included in the mammoth product toss to give away in this great little package! Simply answer the question below for a chance to win all you see above. That’s a Flip Gold Alchemy deck (7.75″), Flip Magic Mushroom griptape from Mob Grip, a magic mushroom hoody (size L) to go with it and a set of Ricta All Stars in 54mm. Hot damn! 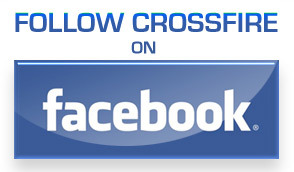 This competition ends on January 21st. 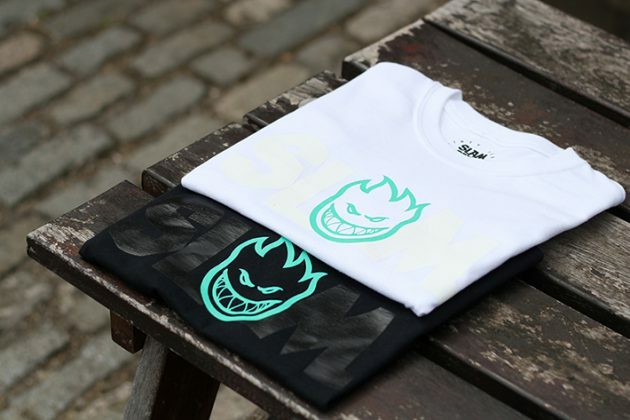 The UK has it’s very own secret weapon in the skateboard game. He’s truly got his own thing going on, pulling out tricks you didn’t think possible and combining them with life threatening stunts that will leave you wet in your y-fronts and shaking with anxiety. If you don’t know of this Northern marvel, then I suggest you quit riding a board with handlebars and 2 rubber wheels, otherwise referred to as the scooter. These contraptions are for girls, won’t get you laid and instantly become a hazard when used during fierce electrical storms. 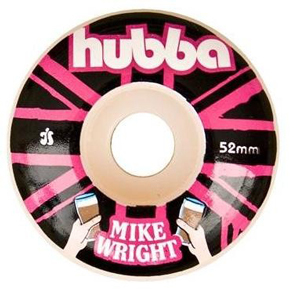 Mike Wright’s wheels, like most out there, are pretty standard in the sense of being a 99 duro, come in a pearly white urethane and allow you the option of selecting 52 or 54mm sizes. I didn’t know Mikey’s age, so I was a little bit sceptical about the 2 ales on top of the black Union Jack that wraps the outside of the wheel, but it turns out he’s old enough to get dirty on liquor, so I don’t have to worry about any underage drinking skateboard union mom chasing me round the streets to confiscate my rollers! I can safely say that my first Hubba experience has thus far met expectations and after a power trip in Eindhoven’s Area 51 skatepark, Amsterdam’s indoor facility as well as the city’s 8 ft concrete kidney bowl in moister than average conditions, they held up beautifully and still rolls fast and round to this very day. 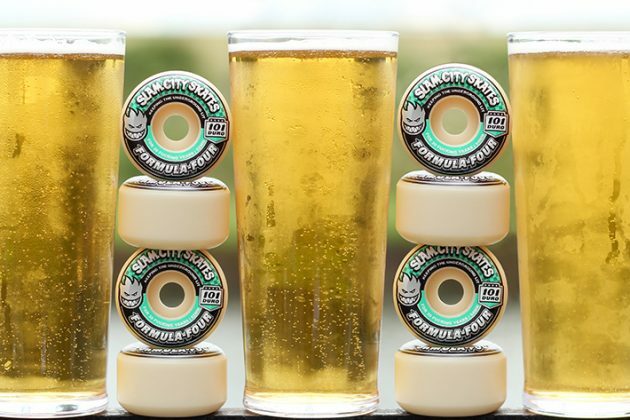 Bones Wheels are slowly being recognised as one of the best wheels on the market today, and with their Street Tech Formula wheels being used by a wide range of street skaters it makes you wonder: what’s caused all the fuss? Are they really that good? The answer is yes! Chad Bartie’s pro wheel, aptly named ‘My Little Bartie‘, comes in – amongst other street friendly sizes – 53mm wheel in a skinny profile. A lot of people have a problem with coloured wheels as in some cases it can affect the quality of the urethane, but be rest assured that with these this is not the case. Bones STF’s are made to go faster, last longer and most importantly slide further! Every skateboarder can agree that there are few feelings better than bombing down a hill, powersliding every 10 seconds to evade the dreaded ‘speed wobble’. Three weeks in and lots of powerslides later, I’m yet to see some sort of damage to this wheel. 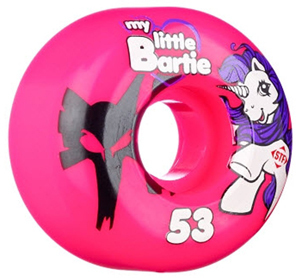 Don’t let the girly colour and graphic fool you, they’re the Terminator of all wheels! They may as well be egging you on to try and flat spot them, but it just wont happen. In fact, I am sure I’ve heard them screaming at me “GO FASTER! SLIDE FURTHER! GO ON, TRY AND BEAT ME!”. Terrifying. All in all I can enthusiastically recommend these wheels. With an RRP of £35 it’ll be more than worth it as they’ll last you till the next millennium. Bones recently released a trailer for their new video which will feature all the usual suspects and – fingers crossed – hopefully some UK heads too! Enjoy! If you’re more of a skatepark aficionado then head over here to read our review on Bones’ SPF wheels designed specifically with skateparks in mind.